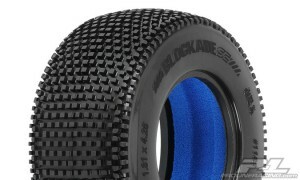 This is a pair of Blockade SC 2.2”/3.0” Tires for Short Course Trucks. Welcome to the future of Short Course Racing – Meet the new tire that will take you there: Blockade SC. Inspiration was taken directly from the National Championship Winning 1:8 Buggy tires, providing you with the latest and greatest technology for your Short Course Truck. The Revolutionary tread design features large lugs for class leading tread life, perfectly balanced tread spacing for maximum forward bite and unique side tread that keeps you planted around the corners. The Blockade excels in a wide variety of conditions – from hard packed to blue-groove and loose to loamy, the Blockade SC tires will outpace and outlast the competition. If you are ready to step into the future and put your SC truck on top, get your own set of Blockade SC tires now!